Text by Malvika Sah. Photographs by Vishal Kullarwar. The tension in the air is obvious as we walk into the palatial Armani Casa show suite in Mumbai. The heavy security with inspection at every level and managers carrying high-tech walkie-talkies in the buildings could put the Z+ security covers to shame. 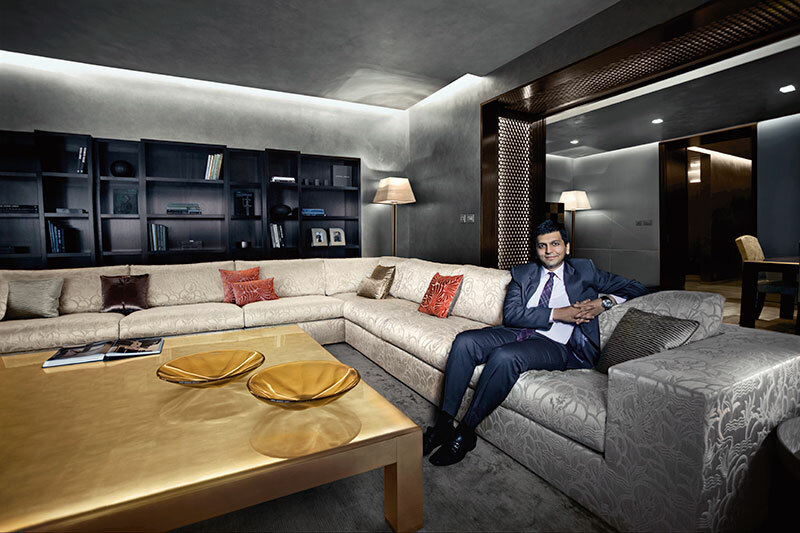 “Mr Lodha has left his office, are you guys ready?” shouts one of them, as we expectantly wait for Abhisheck Lodha – one of the youngest entrepreneurs to have lately changed the face of the luxury real estate markets in India. Even as the tall framed and visibly fit looking managing director of the Lodha group swaggers in, his unusually calm composure and pleasant smile instantly calm the irate vibes of the room and set everyone at ease. 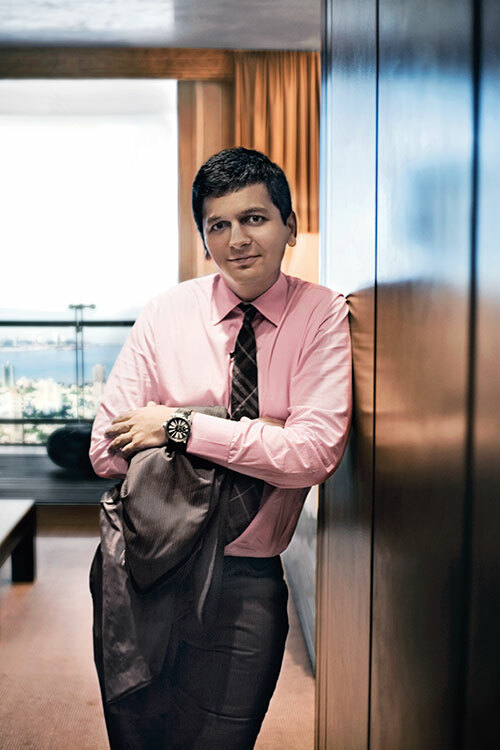 A graduate from the Georgia Institute of Technology, Atlanta, Abhisheck worked as a consultant with McKinsey & Company before joining the family-run company started by his father. In less than seven years he spearheaded it to become one of India’s premier real estate developers which is currently developing more than 30 million square feet of prime real estate over 38 projects in and around Mumbai. One of their most ambitious projects, The World Towers, comprises World One, estimated to be the world’s tallest residential tower at 117 storeys, and the iconic World Crest, one of India’s tallest towers soaring over 700 feet is currently underway and already creating a lot of buzz in the markets. That along with the Lodha Fiorenza, conceived, designed and created by rock progeny Jade Jagger and the Lodha Bellissimo, the only Indian residential development to feature amongst the top 1000 landscapes in the world – are bringing in a new wave of luxurious living into Indian homes. But the soft-spoken Abhisheck who focuses on operational (design, planning and construction) functions of the company looks at the change very casually. “Luxury in India is something we’re rediscovering. India for years had a rich tradition of luxury in all aspects but we sort of lost touch with it. So, I guess we are reviving it in terms of our own lifestyle,” he says nonchalantly. For him, luxury is all about sophistication and being laid back and something that’s not too overt – a philosophy evident in their various projects. In another first, they are also getting a number of global designers into India to merge their sensibilities with that of the desi buyer to give him a global and contemporary address. “I think this marriage of western ideas with Indian culture is something which is appreciable and will evolve into another facet of design,” he says about these mergers. So while their Lodha Fiorenza project showcases Jade Jagger’s signature Bohemian style, the plush World Towers will exhibit sumptuous interiors done up by none other than design guru Giorgio Armani. In fact, the Giorgio Armani and Lodha Group collaboration known as Armani/Casa Interior Design Studio aims to develop creative solutions under the artistic direction of Giorgio Armani. The studio selects materials, colours and finishes to ensure that each design is unique and customised to each client’s requirements. Targeted at the discerning high income Indian with a taste for the finer things in life these apartments are for those who have the sophistication and taste to understand true luxury. Sumptuous upholstery, rich wall cladding, streamlined classy furnishings, elegant accessories blend Indian culture and ethos with the various facets of Armani’s hallmark aesthetic sensibility. “When we set out with this project our goal was to do something where others would say, we’re doing a project which is as good as the World Towers in Mumbai. That was the goal and for that we have to work with whoever is the best in whatever they do,” Abhisheck says with unrestrained excitement. And this very determination and overt ambition eventually led him to get some of the best architects and engineers in the world to come together for this project. After almost six months of persuasion, they roped in Giorgio Armani and his team for the interiors. The usually hard-to-please Abhisheck who modestly admits to being a workaholic, is known for his keen eye for detail, but even he came back pretty impressed when he first met Armani. “He’s a nice gentleman. Of course, since he is much older it’s not like I can have a casual conversation with him, but, he’s very passionate about what he does and is very concerned about his reputation and brand. He makes sure that anything he puts his name on is of the standard that he expects. It’s good to work with such people who have high expectations because that helps you to lift your own potential,” he says bluntly. Abhisheck’s ambitions and aspirations are perhaps one of the most obvious reasons for his phenomenal success. “Over the last decade we’ve been able to successfully demonstrate how things that were previously thought not possible in India can very frankly be achieved with the right amount of effort, thought and ideas. We are setting benchmarks which will not just make our company do well but also inspire the next generation of architects, developers, interior designers in our country to uplift their standard and create on an overall basis, a much better way of doing things in India,” he states. And even though he may be building some of the swankiest palatial homes in India, his ideal home is simple and straightforward, just like him. “Everybody’s home is really a reflection of the person where he feels completely at ease with himself. My ideal home is also a place where I am comfortable with being myself,” he says. Very close to his younger brother Abhinandan who is involved in the sales, marketing and financial functions of the company, the duo work together in the same office and stay in the same building along with their parents. While lazy Sundays are hard to come by considering Abhisheck’s jet-setting schedules, going to the gym or an occasional game of tennis keeps him fit and sane. What is really endearing is to see how he melts at the very mention of his young daughter whom he dotes on. In fact, an ideal day for this adoring father begins by dropping her to school. An actual luxury indeed for someone whose every minute is precious and scheduled weeks in advance. 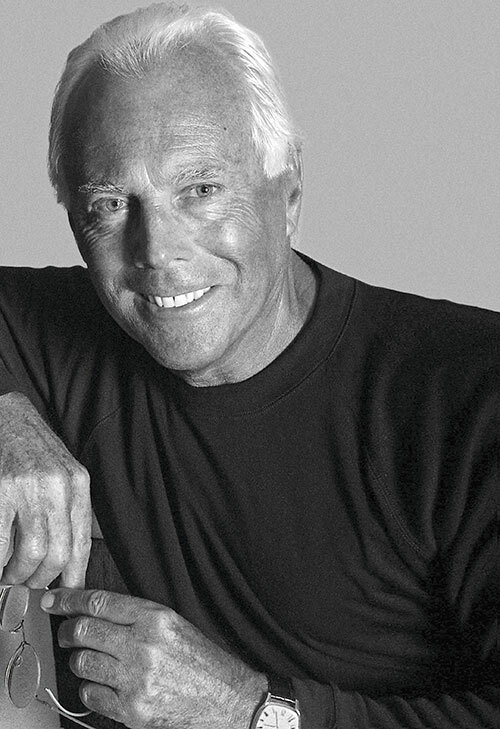 Giorgio Armani talks about the exclusive partnership with the Lodha Group in the design of the World Towers in Mumbai. 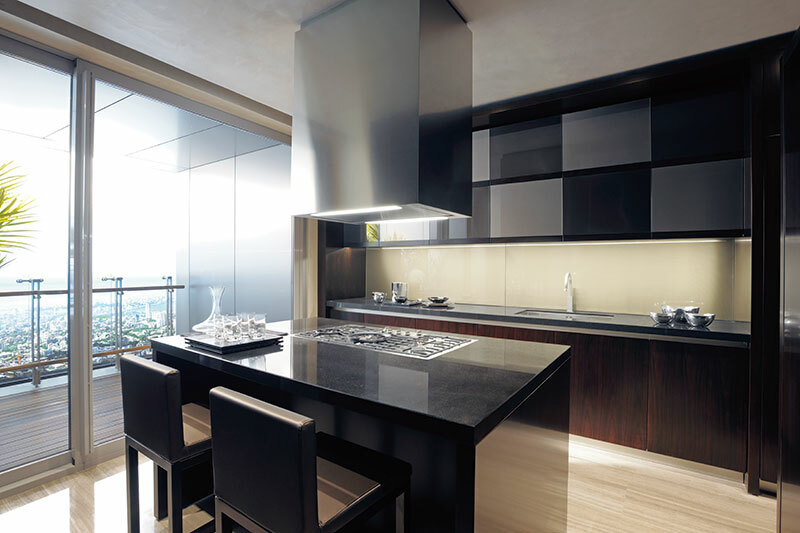 The World Towers will be your first residential design venture in Asia. What made you choose this project over others? India is undergoing a period of enormous change and unprecedented economic development. It may be slower than China’s, but according to experts, that’s what makes it potentially more solid and durable. It is an economy capable of attracting professionals and creative types operating at the highest levels, myself included. Real estate is an offering that requires an in-depth understanding of the market on my part and on the part of the brand. It also requires the public to be ready for it. It has taken years for the right – and sophisticated – conditions to be created that make The World Towers project feasible. How does this project blend the sensibilities of Brand Armani with Indian ethos? I have the utmost respect for this country. It has entered the third millennium as a leader, with its IT experts and mathematicians in demand throughout the world. At the same time, its traditions and culture have become widely assimilated into general world culture. What I am trying to do in my work here is to respect this incredible history, while at the same time respecting my own aesthetic. It is a difficult balancing act, but that’s the challenge of it, and what makes it exciting from a creative point of view. Design wise, what is the USP of the project? I have collaborated on a research project in which I became deeply involved, as every architectural solution, from the layout of the rooms to the furniture finishes, was designed to encourage intimacy and a sense of relaxation and well-being. In particular, the furniture and furnishings were arranged in the spaces to encourage positive energy flow. I also introduced elements to reference the project’s country of location: so there is fretwork, craftsmanship and detailing, with the metallic reflections of white gold leaf, liquid metal and special wall finishes, in homage to the rich iconographic culture of India, reinterpreting its most representative themes in a modern key. Thus, a fascinating, far away culture becomes a unique and symbolic project element.